Of all the research out there, the conclusion is that effective body language comes down to practicing your posture in a variety of situations. Authorized retailers and customers can end up meeting anywhere from a store to a door step, which means retailers must put together training and best practices for each of their representatives. Role playing or talking to a mirror can help a nervous or uncomfortable salesman fine tune their body language skills. And knowing what to do and what not to do are equally important. Try not to stare customers down in a creepy sort of way, but looking them in the eye provides a high level of confidence and intelligence. It also builds trust. When you avoid eye contact, it makes it look like you have something to hide, which can create suspicion. And if a customer is suspicious or lacks trust in what you're telling them, the chances of making a sale go down dramatically. Unless you have a really good reason (like getting rid of a monster itch behind your left ear), it's a good idea to keep your hands under control. Talking with your hands isn't so much of a problem, unless it's excessive. But fidgeting, putting your hands in your pockets, crossing your arms and touching or covering up your face frequently can send a subconscious signal that you're uncomfortable with the situation. Customers will respond better when you're at ease. The impact of smiling can't be underestimated. The important thing to remember is it isn't just about showing your teeth with a big cheesy grin. Being an overall happy person will shine through to your smile, your facial expressions, the way you walk and you're overall conduct. We've all heard about people with a bounce in their step. When life happens and you may not be in the best mood, do something positive to pull yourself out of the funk to be on top of your game at any moment. Taking care of personal matters can be resolved behind the scenes when you're not in front of customers. It may sound silly, but constantly turning away from a customer will make them feel like you're not interested in helping them have a great experience. Square up your shoulders and face the customer. You'll both appreciate the outcome. This one is interesting. A high-pitched tone of voice can make you seem childish or nervous – especially if you tend to "uptalk" or use a rising inflection at the end of your sentences. In fact, it has been shown that people perceive those who have a rising intonation as less knowledgeable, no matter what they are saying. So keep your inflection under control and, if you have to, work on not being too monotone as well. You'd hate for customers to get bored or distracted as you discuss your products and services. If we pay attention to public speakers and news anchors, they also have another thing in common that is closely related to the tone of their voice. Simply put, they talk fast. The speed of our conversations can also exude a certain level of intelligence that builds trust for the listeners. Practicing a faster way of talking can also help you cut down on the number of times you say "uh" or "um". "Appearance is just about as important as body language, so make sure that you're dressed for the occasion. You don't want to skew too formal or too informal, but in case you're not sure what tone to set, it's better to be slightly overdressed than underdressed. If you're meeting with potential clients and are dressed too informally, you might give a sense that you don't really care about gaining their business," says Jeremy Goldman, Founder and CEO of Firebrand Group. And as an authorized retailer, you'll want to set the standard for how you and your team are dressed. If your goal is to create a name for yourselves in your local community, you'll want to take the time to build your brand. Get yourselves decked out with apparel that represents your company image. For example, DISH and HughesNet retailers have access to a full range of t-shirts, polos, dress shirts, jackets and more to help them look professional. You won't regret the time you spend to dress for success. Being prepared with all of the necessary tools and equipment is especially a big deal for authorized retailers that also do installations. 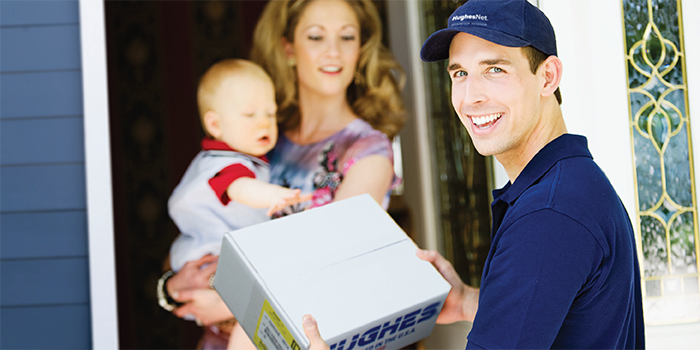 Our DISH and HughesNet retailers have the ability to install satellite TV and Internet in a large portion of the United States. If they show up without a satellite dish, cable, modem, receiver or anything else, they only end up frustrating the customer with a return trip to get the job done right. It might be a good idea to create a checklist of what you need to complete a job successfully – no matter what situation may arise. Customers are typically understanding when an extreme scenario comes out of no where, but they are most impressed if you can handle their installation in a timely fashion. Everybody appreciates efficiency and you'll get a better customer review when you're fully prepared. The text message or phone call can wait. So can your favorite news or sports app notifications. Smartphones have definitely made life easier to stay in touch with the world, but every customer deserves your complete attention. Putting your phone's ringer on silent will also help you to not distract the customer when someone calls or sends you a text. Remember, this is about making a great initial impression and you don't want to be that guy (or gal) that couldn't put their phone down to answer a customer's questions about your product or service. This applies to all the other electronics with a screen as well. Keep those tablets, laptops and other devices tucked away until the time is right and you need to show them something to help make the sell. Following up with a customer is all about confirming the impression they had of you when you first met. Don't take all that time to impress them from the beginning only to let them down afterward. The key to great follow up is to create a system that works for you and your daily calendar. Keep track of your promises and appointments by any means necessary. You can't afford to drop the ball with even one customer. Whether it's answering their phone call at an odd time, calling them back promptly, doing some research, checking to see if they like their service you sold or fixing something that broke, they deserve your time and attention. You'll both appreciate the high level of professionalism that naturally comes with great follow through on every detail. As you reviewed these tips, you may have identified one or two of them that you need to improve. We wish you the best as you take the time to sharpen your first impression skills. Once you're at the top of your game, be sure to help others along the way as well. Enjoy making all of those great first impressions! If you're interested in learning about becoming an authorized retailer through RS&I, check out our other blog articles and see if you find a good fit. We'd love to help you build a successful business.